A trio of automotive industry leaders are preparing to juggle paddling and pedaling duties when they take on a 166-mile waterbike charity challenge in aid of BEN. Group 1 managing director Darren Guiver, Volvo Car UK managing director Jon Wakefield and Allianz Partners UK & Ireland chief executive Tim Tozer plan to travel from the source of the Thames river to the sea in a bid to raise £300,000 for the charity as part of its annual Industry Leaders Challenge. The three intrepid fund-raisers will be cycling on water alongside boats and through a total of 45 locks during their challenge, which will take place over four days, from July 4 to 7, this year. Guiver said: “I am honoured and privileged to have been asked to represent Ben in the ILC initiative - such a worthy cause doing amazing work for industry colleagues across the country. Wakefield said: “The work Ben does to support those who need it across our hugely varied industry is invaluable, so I’m honoured to be joining Darren and Tim in the 2019 Industry Leader Challenge. Tozer (pictured, left) said: “This will be a demanding, fun and real physical challenge that I am thrilled to be involved with alongside my two industry colleagues. “Supporting Ben is fantastic as it gives those working in our industry phenomenal support when it is needed most. Guiver, Wakefield and Tozer follow in the footsteps of Lookers Group chief executive Andy Bruce, whose ILC 2018 fund-raising effort, the Lookers ‘Electric Charge’, raised £215,755 for Ben. This year’s ‘Epic Thames Waterbike Ride’ will see this year’s trio of fund raisers cycle 166 miles on self-propelled Schiller waterbikes, starting at Thames Head near Kemble, Gloucestershire, to the mouth of the North sea. Matt Wigginton, business development director at Ben, said: “We’re beyond excited about this incredible challenge and we’re delighted that Jon Wakefield, Tim Tozer and Darren Guiver are fundraising for us in such an epic way. “Cycling on water on one of the busiest rivers in England is certainly no mean feat. “We really appreciate the support from all at Volvo Car UK, Allianz Partners UK & Ireland, and Group 1 Automotive so far. “We wish our 2019 industry leader trio the best of luck and we’re very much looking forward to following them on their journey upstream. “Our services are funded entirely – and can only continue – through the generous support of the industry. 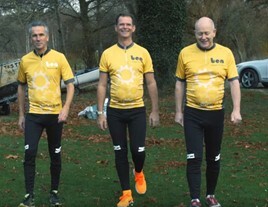 To show your support for the ILC 2019, and the BEN charity, visit www.justgiving.com/fundraising/benilc2019 to sponsor this year's ‘Epic Thames Waterbike Ride’.